Directions: Questions 1 to 2 are based on the following data. Directions: Questions 3 to 6 are based on the following data. 1. A man drives from Albany to Boston. His average speed for 2 hours is 60 miles per hour. What is his average speed (approximately) for the remaining portion of the trip if he completes it in the usual time? 2. Find approximately the ratio of the average speed of a man who drove from Montreal to Boston via Albany and to the average speed of a man who drove from Montreal to Boston via Portland. 3. What was the total amount of money that the Jones family spent on food in 1994? 4. For which of the following categories did the Jones family spend more money in 1995 than they spent in 1994? 5. 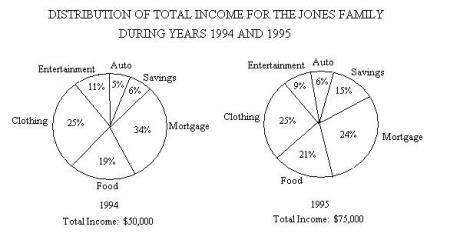 By what percent did the amount of money that the Jones' family spent in the Auto category increase from 1994 to 1995? 6. What is the ratio of the total amount of money that the Jones family spent on the mortgage in 1994 to the total amount of money that the Jones family spent on the mortgage in 1995?